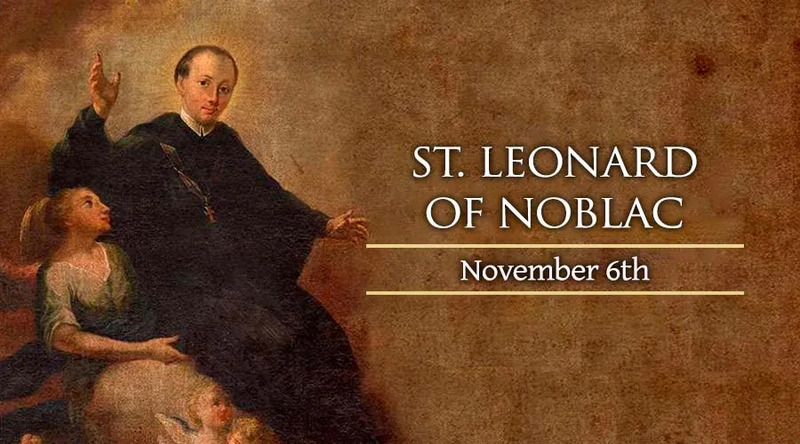 St Leonard of Noblac was a Frank courtier, and during a certian invasion which they were losing, the Queen suggested to Leonard that he invoke the help of God to repel the invading army. He did, and the tide of battle turned, naming Clovis victorious. Saint Remigius, bishop of Rheims then used this miracle to convert the King, Leonard, and a thousand of thier followers to Christianity. Following his conversion, St. Leonard refused the offer of a See from his grandfather, King Clovis I. He then began a life of austerity, sanctification, and preaching. His desire to know God grew so strong that he decided to enter the monastery at Orleans. His brother, Saint Lifiard, followed his example and, leaving the King's court, built a monastery at Meun, and lived there. However, Leonard desired further seclusion, so he withdrew into the forest of Limousin, converting many on the way, and living on herbs, wild fruits, and spring water. He built himself an oratory, leaving it only for journeys to churches. Others, recognizing his holiness, begged to live with him, and a monastery was formed. Leonard had a great compassion for prisoners, and converted many and obtaining their release. He died of natural causes around 559. After his death, churches were dedicated to him in France, England, Belgium, Spain, Italy, Switzerland, Germany, Bohemia, Poland and other countries. Pilgrims flocked to his tomb, and in one small town in Bavaria there are records of 4,000 favors granted through Saint Leonard's intercession.